Cheapside, on the northern boundary of the Ward, links Newgate Street with the junction of Queen Victoria Street, Cornhill, Threadneedle Street, Princes Street, Lombard Street and King William Street via the small section known as Poultry. The street was established in 1104 to intersect the main Roman road at its western end. 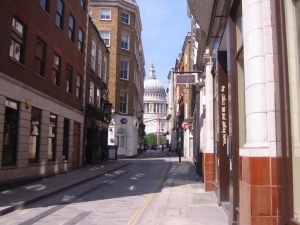 In medieval times it was known as ‘Westcheap’ and was the widest street in the City . It is the former site of one of the principal produce markets in London, cheap broadly meaning “market” in medieval English. 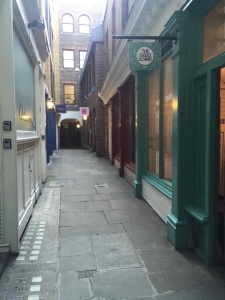 Many of the streets feeding into the main thoroughfare are named after the produce that was originally sold in those areas of the market, for example, Honey Lane, Milk Street and two of the other streets bordering the Ward, Bread Street and Poultry. The iron balcony on the tower of St Mary-le-Bow is said to be reminiscent of the temporary “silds” or granstands which existed on Cheapside in the 12th and 13th centuries. Cheapside is now a major major retail centre. 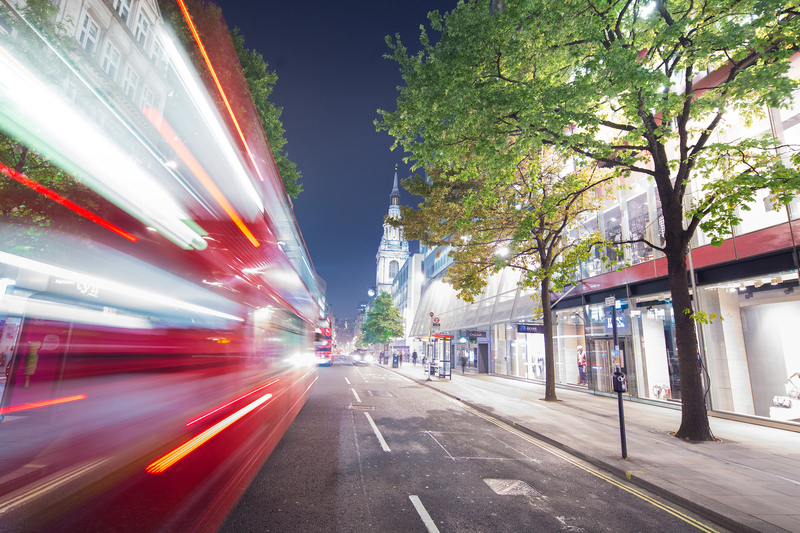 The Cheapside Business Alliance has been established to manage a coordinated approach to development, generating a step change in visitor’s perceptions of Cheapside by creating a strong business and retail voice for the area. Ambitious plans to improve the road layout and widen the pavements have now been completed, once again making Cheapside a prominent part of the City. Running off Bow Lane is Well Court, formerly known as Weld Court. In 1701 it contained the original home of the Cordwainer and Bread Street Wards School. The Bow Lane end was called George Yard until about 1863. 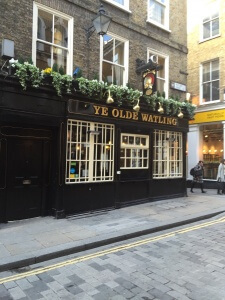 Ye Old Watling Pub, on the junction of Bow Lane and Watling Street, was the first City building to be rebuilt after the Great Fire of 1666. On the other side of Bow Lane is Groveland Court, at the end of which is the historic Williamson’s Tavern. Like “The Watling” pub, Williamson’s was built just after the Great Fire of London but, in this case, originally as a private dwelling house for the English General Sir John Fastolf (whose name Shakespeare changed to Falstaff). For nearly 100 years, however, before today’s Mansion House, it was the official residence of successive Lord Mayors of London. 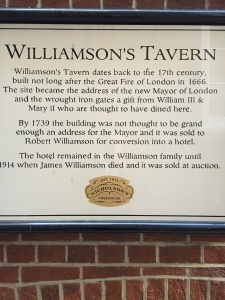 In 1739 Robert Williamson bought the building, converted it in to a hotel and gave it his name. Lord Mayors continued to live there until 1753. Today, the dominant features in Groveland Court are the stylish wrought iron gates presented to the incumbent Lord Mayor by William III and Queen Mary when they were entertained there by him. The Royal Crest can be clearly seen above the gates at the entrance to today’s pub and restaurant. Watling Street is the name given to an ancient trackway in England and Wales that was first used by the Celts mainly between the modern cities of Canterbury and St Albans. Watling Street in the City of London does not seem to have been part of that route. However, it has an equally famous history. 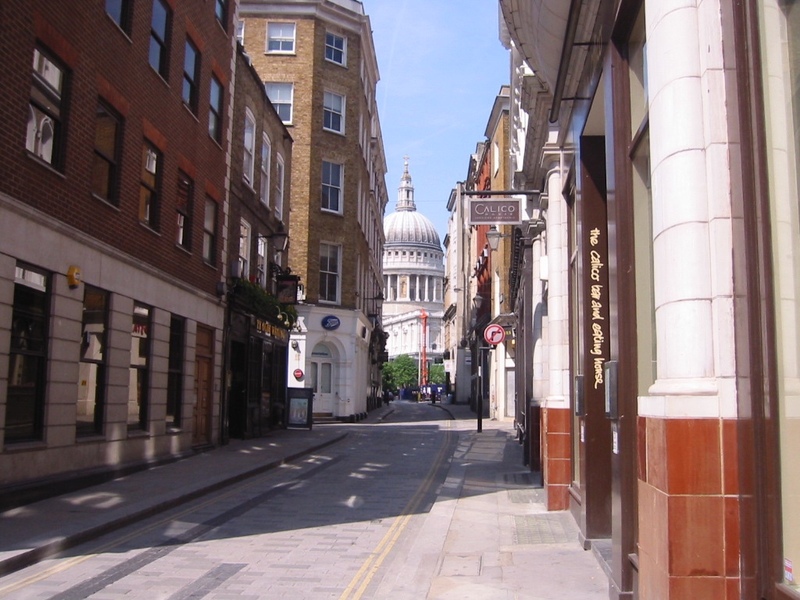 Once called Aethling (or Noble Street), but commonly called Wathling Street, it is considered to be the oldest street in London – the Saxon Athalingestrate (1212). It was the principal middle street or Praetorian Way of Roman London, the “Noble” or “High” street of the City. 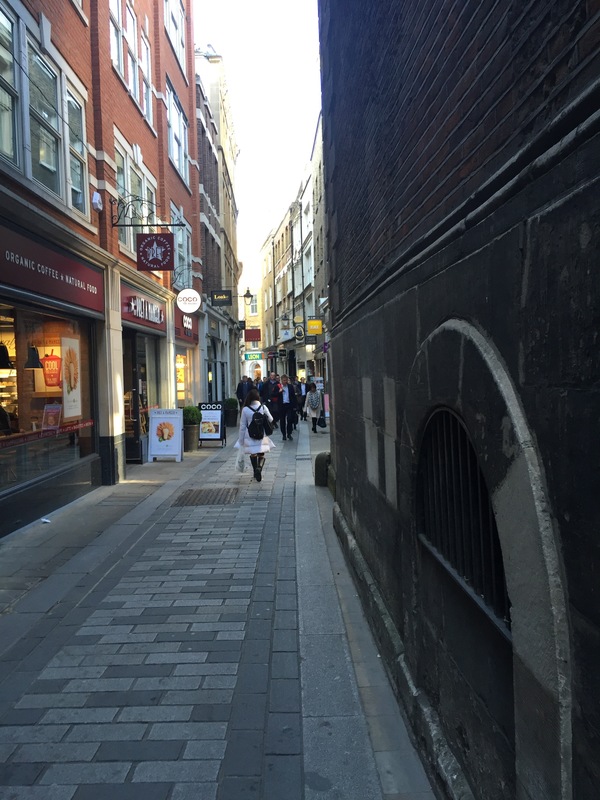 Street is just 180 metres long, running from Queen VictoriaStreet to New Change. It has been part of an extensive streetscene scheme. 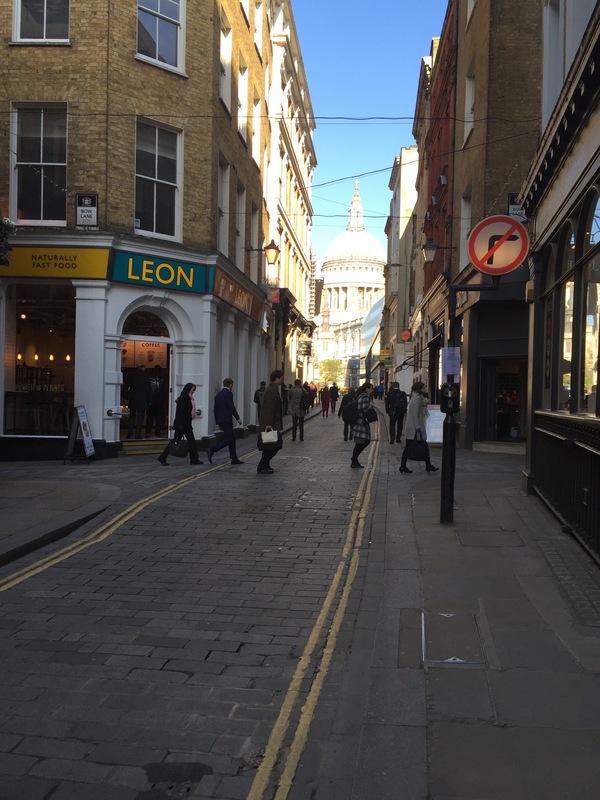 It is now pedestrianised and paved with granite setts, and gives a fine view of St Paul’s Cathedral. The street houses shops, restaurants, cafes, offices, the Corwainer Statue and even a fine art dealer. St Mary-le-Bow Church on the corner of Cheapside and Bow Lane, is one of the great historic churches in the City of London. The Church was founded in or around 1080 as the London Headquarters of the Archbishops of Canterbury. The Church survived three devastating collapses before being completely destroyed in the Great Fire of London of 1666. Between 1670 and 1683 the Church was rebuilt by Sir Christopher Wren. In the Second World War the Church was again destroyed by enemy bombing. A program of reconstruction was implemented in the 1950s and 1960s. The new Church was reconsecrated in 1964. The Church was largely rebuilt to the original Wren specification. The massive steeple is 220 feet high. The steeple houses the famous “Bow Bells”. A volume of essays about the church – St Mary-le-Bow – A History was published in 2007. The book is deliberately both scholarly and accessible to the ordinary interested reader, with much that is local, social, architectural and historical as well as ecclesiastical. The book is available from the Vestry for £30. St Mary Aldermary at the South end of Bow Lane, is also an historic City church. There has been a church on this site for over 900 years. In 1510, Sir Henry Keeble, a grocer and Lord Mayor, financed the building of a new church on the site. When he died in 1518, however, the tower was substantially unfinished and remained so until 1629 when two legacies enabled it to be completed. The church was said to have been among the largest and finest of the City’s churches and a number of City notables were buried there. John Milton, the poet, married his third wife in the church in 1663. The Church was greatly damaged in the Great Fire of 1666. While parts of its foundation walls and towers survived it was largely rebuilt in the period 1679-82 under the supervision of John Oliver, one of Christopher Wren’s deputies. The church escaped relatively lightly in the 1939-45 War. All the windows were shattered and some plaster fell from the vaulting but the building itself remained intact. 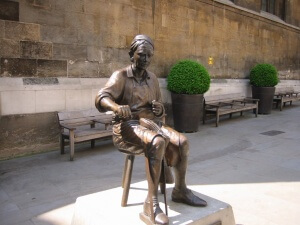 The Cordwainer statue was a joint initiative by the City of London Corporation and the Ward of Cordwainer Club to mark the 100th anniversary of the Ward Club. It was funded the Corporation, the Ward Club and some individual members of the Club and businesses. bronze statue, the work of Alma Boyes, was unveiled in 2002 in a temporary location in Bow Churchyard. It was subsequently relocated to its permanent home in the newly paved area of Watling Street alongside St Mary Aldermary Church. 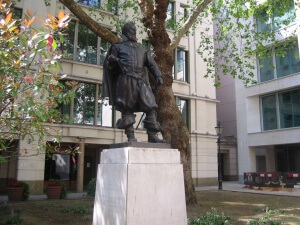 The statue of Sir John Smith stands in the middle of Bow Churchyard. John Smith, born in 1580, had a colourful early life including being a soldier in the Netherlands and in Hungary, being captured, taken to Turkey and sold into slavery, then murdering his master and returning to England in time to participate in the settlement of Virginia. He was elected Governor of Virginia for a one-year term in 1608. He returned to England in October 1609 following an accidental gunpowder burn and became Virginia’s most effective propagandist and historian. He died in 1631 and was buried in St. Sepulchre’s Church in Snow Hill. The statue, by William Couper, was erected in1909. The Temple of Mithras in Walbrook is a Roman Temple whose ruins were discovered during rebuilding work in 1954. The Temple was built in the mid-Third Century and dedicated to Mithras, a Roman God. The whole site was dismantled and moved a short distance away to the front of Temple Court where the foundations were reassembled for public display. Temple Court itself has now been demolished and the new development to replace it will restore the Temple of Mithras to its original location. No 1 Poultry is one of the most prominent recent City developments. It was originally designed in 1988 by James Stirling, and completed a decade later by his partner Michael Wilford. It contains clear allusions to its predecessor, the Victorian Mappin and Webb building, which previously occupied the site. It is built in pink and beige stone stripes. The structure is triangular and contains circular, square and triangular recesses on its facades. It houses a large variety of offices, restaurants and shops, many underground, and has direct access into Bank station.